UPDATED: The first Norwegian fighter jets to be sent into combat in the UN-backed military operation against Libya took off from their base on Crete on Thursday, and more flew off during the night. None used their weapons, according to Norwegian military officials, while other coalition forces attacked several Libyan targets. 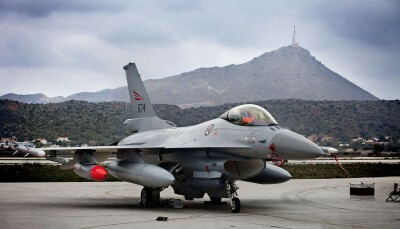 Two Norwegian F16s headed for Libya Thursday afternoon, flew over the violence-torn country for a few hours and were back on Crete by early evening. Norwegian Broadcasting (NRK) reported that two more of the fighter jets from the Norwegian Air Force took off during the night and returned safely to Crete early Friday morning. Defense officials were unwilling to detail their activity, but claimed they had not dropped any bombs or shot any of the missiles with which they are equipped. The Norwegian flights lasted around three hours, reported NRK, from midnight until around 3am. Their mission was “to look for and localize enemy activity,” such as rocket launchers and tanks on the ground. More flights were expected on Friday. A spokesman for the US forces, to which the Norwegian jets are assigned, said that western coalition forces fired a total of 14 Tomahawk missiles at Libyan targets on Thursday. ABC News reported that a French fighter jet had shot down a Libyan military flight that failed to respect the UN’s no-fly zone. The Norwegian jets are under US command after an extraordinary Council of State on Wednesday approved their transfer to the Americans’ North African operation. They are thus expected to be given the same assignments as their allies. The Norwegian Air Force and the government have stressed, though, that Norway will retain full control over how the jets will be deployed. The Norwegian jets arrived at their new base on Crete Monday evening and were ready for action from Wednesday. Allied jets had continued bombing raids over Tripoli Wednesday night as well. The international coalition, which aims to enforce a UN resolution last week to protect Libyan civilians from their dictator’s regime, otherwise is charged with securing air space over Libya to prevent attacks on civilians from their own government.